Choosing between kitchen styles can be a difficult task. In a world of over choice and abundance of new ideas, making your own personal statement requires work. The kitchen design should project balance and harmony, and describe the hidden dynamic of your family and personality. Designing a kitchen, therefore, is a rather intimate process. Beginning to read this guide, a torrent of new ideas will hit you in a staccato sequence. Do consider, however, to check each and every one against your unique lifestyle preferences. Knowing exactly what you need helps when differentiating not only between kitchen layouts, but choosing specific kitchen units as well. Think practical first, and then add some detail. Regardless whether you are in the process of doing a kitchen renovation or building a brand new kitchen, the same principles apply. So let’s start by setting up the drawing board. Kitchen Ideas – How to Choose the Best Kitchen Design? When you stop to observe examples of designer kitchens, a striking similarity appears across the board. Above anything else, they all aim for consistency. 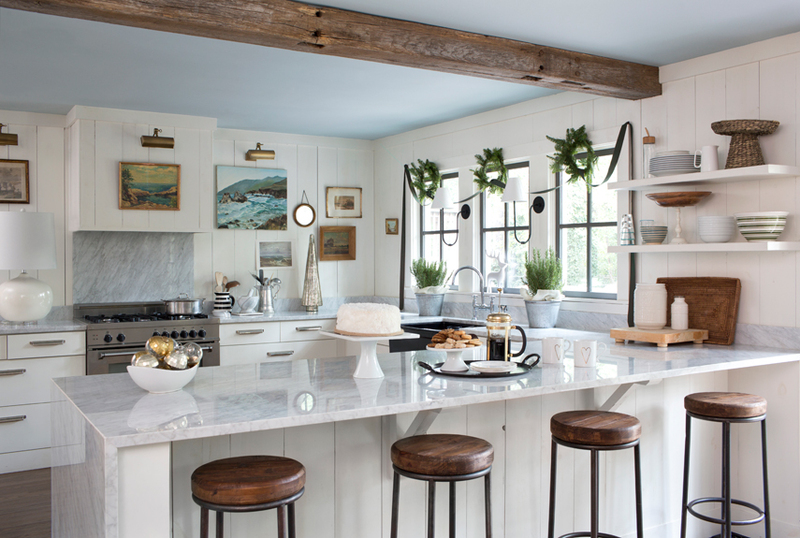 A spacious or small kitchen, modern or rustic one… the premise is simple- just pick your style and stick with it. Translated further, this means finding balance between the kitchen floor, the cabinets, the material and color palate. First of all – and this goes without saying – you should consider the limitations of your space. We all want a modern kitchen with the garden variety of units included, but not everything can fit comfortably according to plan. And though counterintuitive, this can be a good thing. Instead of having to choose between hundreds of items, you can rule out some and pick one or two to highlight instead. Don’t have enough room for installing a kitchen island? Great- you can settle down for a kitchen bar and still design a kitchen that commands attention. Start by drawing your layout, and then think of a dominant color. This will serve as your backbone – the proper framework – on top of which you will chose style and add ornamentation. The style choice will roughly dictate the type of floor you are about to install. Tile or wood, it depends on what you are aiming to achieve. Modern kitchen, minimalistic, or more welcoming and warm, it should mainly reflect your personality. When not entirely sure what to go with, choose neutral colors. They will give you the clean and monochromatic effect, while still radiating a degree of warmth. Even if you choose to work with a kitchen designer, he will ask you these same questions. So be pragmatic first, know what you need, chose your color, style and everything else falls into place. One look over an Ikea catalogue and you start to understand what truly makes excellent kitchen décor. Regardless of the space and style, it’s all about those cabinets. Carefully combined with a matching countertop, they give your kitchen its distinctive look. And here is where you should pay attention. The cabinets usually take up most of your kitchen space, and therefore dictate the dominating color. Yours is the choice to either match them with the color of the countertop or aim for a touch of contrast. The space between the cabinets and countertop, when appropriately colored, can make a dramatic visual change as well. Go with a slightly different color palate if you want more openness and bold contrast if you want to additionally highlight the space and draw attention. Naked bricks or mosaic tile… it’s all about your style choice. Some people prefer to add contrast between the kitchen cabinets and the floor as well, and this can highlight them even more. You can even combine these by placing all of your appliances below the counter, and going with window cabinets on the wall. They look rich, ornamental and add a more vibrant look to your layout. If going with window cabinets I would definitely recommend choosing a darker and more potent color palate. When there is less material showing, you’d want to highlight every inch. If you are a wine aficionado, and fancy having a bottle collection, why not showcase some of it as well? Wine cabinets can perfectly fit with small kitchen designs. Even a smaller six-barrier cabinet can add depth in your kitchen design and spice up the layout of your kitchen cupboards. Also consider manipulating natural light. Latest kitchen designs tend to add a window right above the sink, and between your cabinets. Natural daylight can create warmth, and is perfect for larger families who tend to spend much of their time around the kitchen. It affects mood in many ways as well. If you are lucky enough to have your kitchen layout allowing for a window opening, consider using the curtain as a specific design element that will further highlight this small space. Window cabinets can be covered with small and chic curtains as well, and this usually allows you to have the decorative advantage of adding a window cabinet without necessarily having to decorate the inside of it as well. Nothing spells luxury better than a well-designed and centrally placed kitchen island. Larger ones can include the stove or a longer countertop, and smaller ones provide only a few square feet of working surface. But regardless of size, a kitchen island dwarfs every other detail in significance. First of all, you will want to make sure your kitchen island is not just unceremoniously dumped out there in the middle of your space. Measure carefully and aim for symmetry between surrounding countertops. The height should be equal to the surrounding countertops, and color should usually match the cabinets below the counter. If you want to install the stove and oven within your kitchen island, make sure to plan the ventilation upfront. Otherwise, I’d recommend installing hanging lights in order to ornament the space and highlight the kitchen island even more. People routinely underestimate the importance of lighting, but when placed carefully it can completely change the look of your kitchen design. 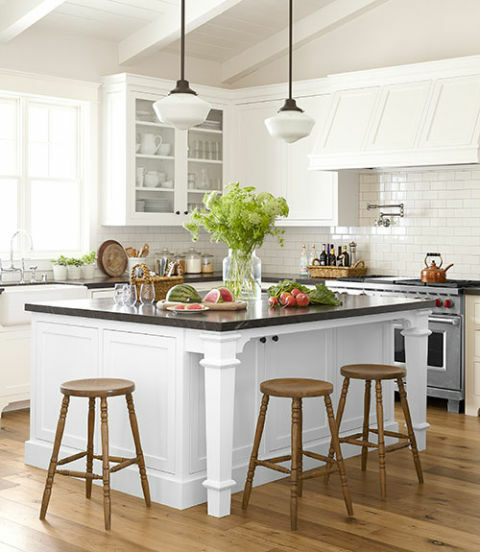 Back to the kitchen island though, you’d want to consider adding extra bar stools as well. They will add extra functionality by transforming your kitchen island into a breakfast table. Coupled with ambient lights hanging from above, this will give your kitchen a strong highlight during the second half of the day. You can consider installing a book shelf as well, giving your kitchen some personality and additional vibrant touch. Don’t have enough room for the island? Worry not. Just think about remodeling the space by adding a kitchen bar instead. You can still utilize those hanging ambient lights and chic bar stools, creating the same effect. Besides, placing the kitchen bar on the side where your living room is can give you an unobstructed view of the living space, providing for a nice family atmosphere. Observing trends from recent years, minimalist and Scandinavian décor saturate the list of best kitchen designs. Much the same is increasingly true when we talk about small kitchen ideas, since these often require novelty in order to capture attention. And while traditional kitchen design follows a recurring set of rules, modern ideas require bold color statements and marked ornamentation. To simplify pretentious vocabulary, you’d want to either aim for compact design, or interrupt patterns completely. The goal is to make a visual impact with both colors and material. As for color statements, you’d want to choose a strikingly dark palate, or excessively bright colors. Making a compromise between the two weakens the visual statement. Darker colors, especially grey, can mix perfectly well with marked yellow or green. You can still use color difference to highlight certain elements and units, but stay within the same color pattern when it comes to potency. Granite floors and different tile patterns can help when creating a visual statement and you should think within the lines of something unique and expressional. Then there is the transitional kitchen which combines the traditional charm with contemporary chic. Reverse engineering from the above mentioned principles, you can simply add a dash of modern and achieve balance between styles. If new kitchen designs seem overly modern, this is a nice way to divorce from the traditional while still not entirely embracing the contemporary. A contemporary ambient can also be easily paired with rustic features. Sounds counter intuitive at first, but Scandinavian kitchen design uses this all of the time. Consider adding a wood fueled furnace, or combine naked brick with contemporary materials for your cabinets. This can be refreshing in so many ways, especially when you showcase the modern by using bright colors and the old by using a rustic set of both colors and materials. Want to achieve a modern look? Don’t use kitchen cabinets at all. Paint the wall with a crisp and clean color, supplementing your below-the-counter cabinets. This can make your kitchen layout to seem rather spacious, and serve as refreshment from repetitive kitchen design ideas. What to pay attention to when doing a kitchen remodeling? How are you going to solve the heating? 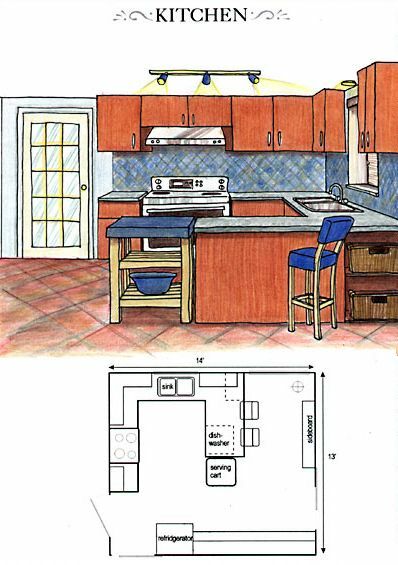 Open floor plans might have different requirements from small kitchen layouts. If you rely on central heating, consult someone when designing your plan. Radiators on the other hand may supplement your design efforts, so see that you include the heating source in your design sketches as well. If you live on the south or somewhere where it’s warm, consider air conditioning too. Opening a window early, especially when you are starting with construction and remodeling can be a smart move. Many people focus on the design side of things without considering functionality first. Good design – and this goes by definition – should solve logistic problems first and foremost. While custom carpentry may end up costing you more in the end, it’s the only solution when going for a fitted kitchen. You can save money however, by choosing the layout by yourself, and specifying a certain design pattern. Make sure that you have carefully researched every unit that will fit into your kitchen. See whether or not all of your desired items are in stock, way before you start with the remodeling. It’s quite frustrating to complete the order for the carpentry only to find out that your specific sink size is out of stock and sells for twice the price somewhere else. Plan upfront and save yourself the headache. Think about your habits, and family requirements. Sometimes it’s tempting to put decorative elements before pragmatic use of space, but running out of cupboards to fit your pots and dishes is a ticket for another kitchen remodeling in near future. What is the perfect kitchen design for you? All things being considered, you should strike a compromise between budget, use of space, and style preferences. The more you plan upfront, the easier your kitchen remodeling becomes. Think carefully about the color palate, the kitchen floor, the cabinets… Choosing one or two highlighted items will help you save on price while still creating a certain artistic and aesthetic detail. I hope these pictures of dashing kitchen design ideas opened your mind to all of the possibilities, and you can simply reverse engineer your way to a new and spectacular kitchen layout. Make sure to stay consistent with a specific style though, and plan from the bottom upwards. Plan the lighting, the heating source, the number and positioning of all of the appliances. Finally though, make sure that whatever kitchen design you end up with perfectly reflects your personal style and speaks loudly about the way in which you prefer to function around the home. The kitchen can very well be the most important area in the entire home, so make your design with the future in mind. Browse Furniture UK Online for more interesting and meaningful articles!